Hear directly from Keith Frazee and Max Zeryck from the University of Oregon about their more than 2 years of Orientation App Success in this free, on-demand webinar! Watch it now. 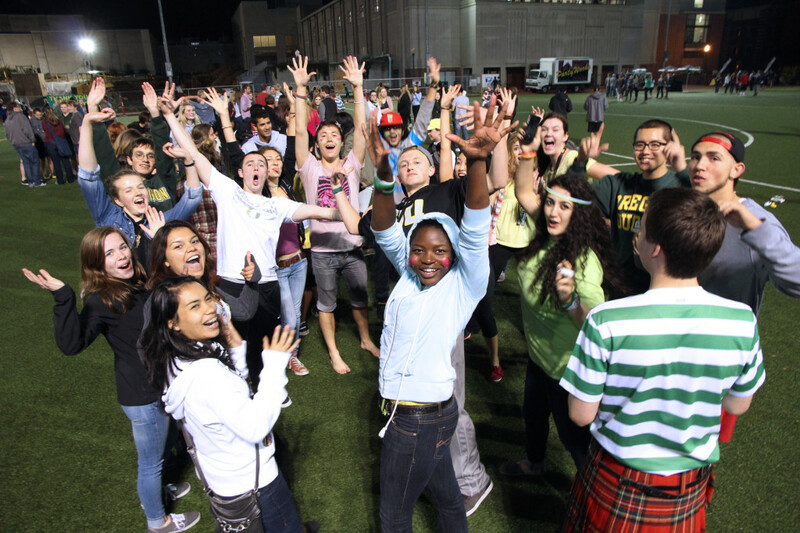 Each year, the University of Oregon finds itself welcoming 5,000 new students to its campus. Incoming freshmen, transfer students and international students will join the ranks of other Ducks and be able to call the University of Oregon their academic home. Like most universities, the University of Oregon conducts a summer orientation for its incoming students in order to welcome them to campus, take care of some administrative tasks, and give them a glimpse into their new lives as college students. This year they made some serious upgrades. Keith Frazee is the Assistant Director of Orientation at the University of Oregon. He works within the Division of Enrollment Management along with Admissions, Financial Aid and the Registrar’s Office to set students up for success for their time at the university. Orientations are accompanied by printed programs and Max Zeryck, one of Keith’s Student Directors, calculated that they had printed 31,000 pages the previous year to do so. In addition, Keith was acutely aware that most incoming students would be bringing along their smartphones. He saw an opportunity to reduce waste and take advantage of an already-ubiquitous technology. Keith had used Guidebook as an attendee at a conference. He recognized the benefits of creating an event-specific mobile app and made the leap that this could be a perfect fit for orientation. Schedules, campus maps, important contact information and FAQs – all of the content of a traditional orientation program – could be elegantly and easily housed within the guide and, unlike a traditional program, stay with the students beyond orientation. Keith’s Vice President saw the value as well and recognized the potential for creating other Guidebook guides on campus. Homecoming, Commencement, and Fraternity and Sorority Life Recruitment could all benefit from having their own mobile guides. 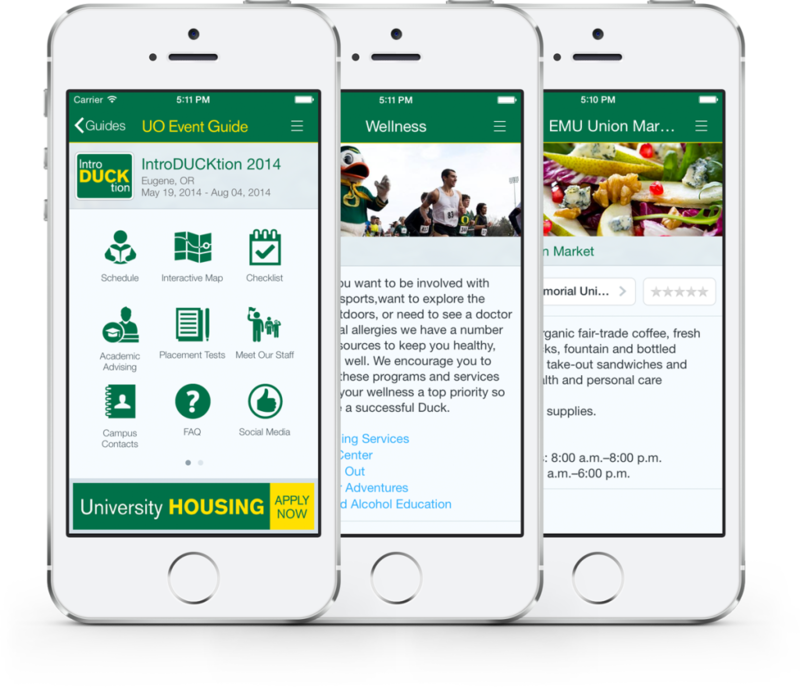 So with a plan to expand Guidebook’s usage across campus, the university opted to have a custom University of Oregon Events App built that would house all their future guides. It looks and feels like a seamless part of the University of Oregon. The university used orientation to create a pilot guide and the results exceeded all expectations. Keith was happy to be the university guinea pig on the project because, as he says, “orientation intersects with so many departments. Introducing the app took very little effort. Orientation is the best entry point for any university to adopt software.” Read more on how New Student Programs are a great starting point for deployment here. Keith and Max worked hard to build the guide together. What they found was that the usefulness of the guide was directly proportional to the amount of time spent gathering the content and ensuring its quality. Max worked with departments across campus to gather information and photos and found that sending out a spec sheet of what he was looking for got him the best results. They even hired a graphic designer to create custom icons to match the app’s branding and a photographer to take pictures of the staff. As they worked, they began to play with the idea of expanding on a traditional program and were able to utilize more of Guidebook’s interactive features to enhance the user experience. Maps were made to be interactive, they were able to solicit feedback from within the app itself, and social media integration was utilized to get students in on orientation-wide conversations. This app is deep. Students can see academic major requirements, information about placement tests, and campus contacts that will continue to be useful throughout their careers at the university – not just during orientation. It’s a great example of how a guide can be as extensive as the builder’s willingness to fill it with content. The University of Oregon’s orientation guide saw about 6,800 unique downloads for about 4,500 students that attended the sessions. That accounts for a 100% adoption among students and additional interest in the guide from parents. App adoption was a part of the plan from the beginning. Such high adoption rates were a result of pre-orientation promotion, including one mailing and four emails – all which included a link to the Guidebook-provided, app-specific landing page. The University of Oregon set out to meet students where they were at. Not only were they trying to streamline a process, but increase students’ access to critical information with a technology they are already using. Now with the university’s mobile events app – and this first orientation guide – they will be able to do just that. It’s a major win for the university but, more importantly, a major win for their student population. Want to hear the details about creating an Orientation App directly from the source? We’re hosting a webinar this Friday, May 6 along with Keith Frazee from the University of Oregon. He’ll talk about what it’s taken to set the app up, promote it, maintain it, and how he’s had over two years of success with it.